Attention Windows 7 / Windows 8 users! / Windows 10 users! Thanks timsoft for suggesting this. Install if you get the error "Program could not be initialised correctly (0xc0150002)"
If you would like to contribute, please let me know! here, will work for both games. Thanks to DiGiT for making TS and JustTesting1234 for the code to AOKTS 1.1.0 and his valuable research! Thanks DoctorWillCU for updating TS for Rise of the Rajas! Great job! Keep checking here for updates or to make a request! NEW:added option to remove all text files for all 16 player slots to fix a bug in Age of Empires 2 HD that caused all 16 player slots to fill their AI slots, making =HD= CBA ALLinONE_V100 1.66MB. NEW: Increased size of cinematic string to accommodate for new scenarios. NEW: Can now edit unit position to 2 decimal places. BUGFIX: Fixed bug saving ludakris sized maps. BUGFIX: Inverse conditions now displayed correctly. 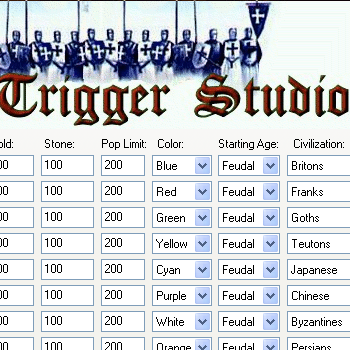 NEW: Trigger Scrawl -- copy an easily readable text version of the triggers. NEW: Rearrange triggers, conditions and effects by click and drag. NEW: Rename triggers by pressing the Enter key. BUGFIX: Edit scenario dependencies working now. BUGFIX: New research technology effects wouldn't save. Now they do. NEW: Edit starting age for SCX version 1.26. NEW: Change type of all units of a given type (per player). BUGFIX: AOHD's longer trigger names no longer crash TS. NEW: Save African Kindoms scenarios. Awesome! Thank you! Really thank you! I thought I had lost one of my projects forever. Now thanks to this I can recover it. This utility is a great feat for the Aok and Aof community. I'll continue working on it and try to have the AoF effects and disables section working flawlessly, put the 'save output format' in the ini file rather than have separate exes and integrate the changes danielpereira made for the UserPatch. Updates will come here. Thanks Lildbehr! It makes me happy that you were able to recover your lost scenario as the same thing happened to me. I know how annoying it must've been.
" Convert scenarios made with AOEHD back to the original format so works with the classic aoc. " Awesome work! I've been creating a scenario with the HD editor lately, and this is the perfect tool to make it AoC compatible, which it was originally intended to be. Would it be possible for me to have a copy of that scenario you are working on? I'd like to catch that bug, whatever it is. I don't seem to be having that problem with any of mine. The first version (the one you first uploaded here) works fine though. hmm.. What version of windows are you running? Just cos I've only tested on my own system.